After an epic and storied 45 year career that launched an era of rock n roll legends, KISS announced exclusively on NBC’s America’s Got Talent tonight that they are hanging up their 9-inch tall touring boots. The news was delivered in trademark larger-than-life KISS style with a blistering performance of “Detroit Rock City”, proving why the band is known as one of the most iconic live performances that simply can’t be missed. The Rock & Roll Hall of Famers who have sold more than 100 million albums worldwide have toured to nearly every city on the planet and played every venue imaginable. 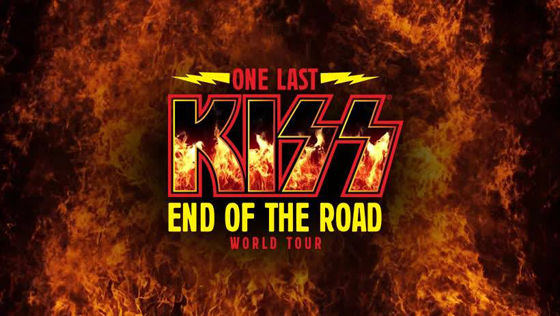 Having played for Kings & Queens, for U.S. veterans, and for millions of devoted KISS Army fans, they will play their final shows as part of the multi-year END OF THE ROAD WORLD TOUR. Dates have yet to be announced but www.KISSonline.com will have all the updates in the weeks to come.